I don’t want to seem like I have become an employee of Kerrygold, but when they make great cheeses and keep sending you free coupons, you kind of have to keep making creations (aka grilled cheese sandwiches) using their products. And then blog about them. For the world to see. Challenge. Accepted. With Irish Soda Bread. A classic combination from the capital city of Ireland, Kerrygold’s original all-natural Dubliner Irish Cheese and its perfect pair, an Irish Stout, are now together in a new unique cow’s milk cheese. The classic flavor combination brings out the sweet, nutty, rich flavor of Dubliner Cheese and swirls and tumbles it together with the malty, caramel, bitter flavor of a perfect pint of Irish Stout. This cheese is delicious. It really is as simple as that. I love Kerrygold’s tradtitional Dubliner cheese, so how could I not like said cheese enhanced by Irish Stout? It is creamy and smooth and has that great added punch from the Irish Stout. 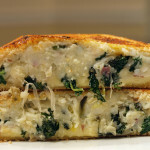 This would be great as the star of a simple grilled cheese or even as part of a cheese plate. Anyway you present this, I can guarantee it will be delicious and everyone will love it. And don’t forget, Kerrygold does have a Cheddar cheese enhanced with Irish Whiskey, which you should try as well. After cutting the cabbage, I placed it in a bowl with a little bit of water and into the microwave for about 3 minutes or so. This is a quick way of “steaming” the cabbage so it would be soft enough to be used in the actual grilled cheese. Using just one potato, I forked it and placed it in the microwave for about 4-5 minutes to soften. Then, I peeled the potato and sliced it into rings. There were many ways to move forward with the ingredients that I had prepared. I could mix up the cabbage, potatoes and cheese like smashed potatoes, throwing in green onion for additional flavor. I could sauté the cabbage and make chips out of the potatoes. These are great options that I simply decided against. Instead, I took an Irish dish and added a French-American flare to it. In multiple layers, somewhat similar to potatoes-au-gratin, I placed the cabbage, potatoes, crumbled cheese and green onions in a small casserole dish. I added salt and pepper for additional flavor and then baked it. I cooked the “casserole” on 425* for 10 minutes and then broiled it on low for 5 minutes, just to get somewhat of a brown color on top. Feel free to broil it for longer if you would prefer it to be more brown. Once it was cooked, I scooped out the mixture and put it in between two slices of the Irish Soda Bread. I baked that for just a few minutes on 325* and then it was time to plate. Beer bread had been the suggestion of Sous Chef Jr. and that is what I was leaning towards until I stumbled on a local bakery and their sign advertising Irish Soda Bread. 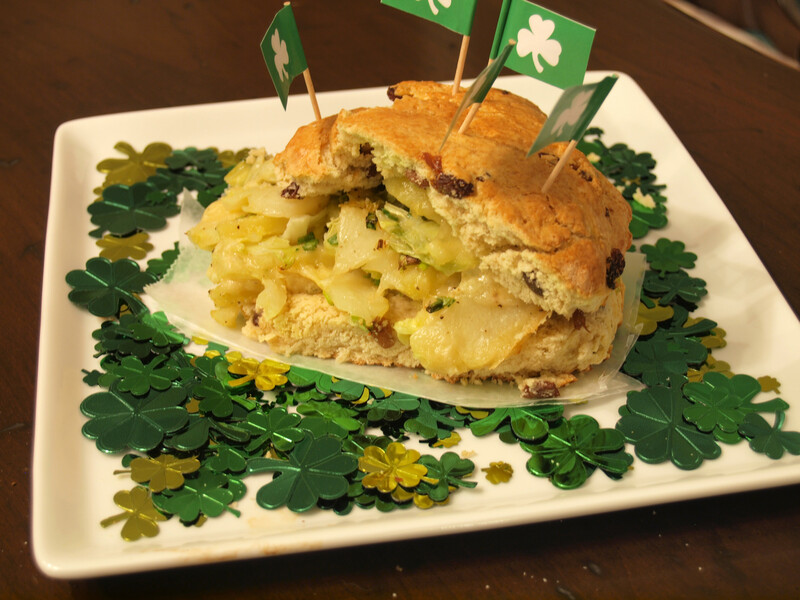 I had never even heard of Irish Soda Bread let alone tried it. When I finally went to buy it, I didn’t even know what I was looking for (and kind of made a fool of myself since it was right in front of me). When I saw it, I still went for it. 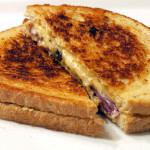 It is a very delicious and sweet bread, but also very dense, which caused minor issues with the grilled cheese. I cut the bread in half vertically and then in half horizontally. 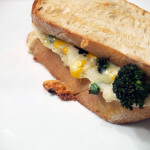 Then, the bottom just seemed to be too thick, considering the bread’s denseness, so I shaved some of the bread off. 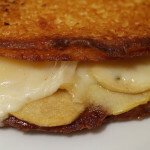 This grilled cheese was delicious. The Kerrygold Dubliner Cheese with Irish Stout is amazing. The potatoes/cabbage turned out really good, especially since I had no idea what I was doing. 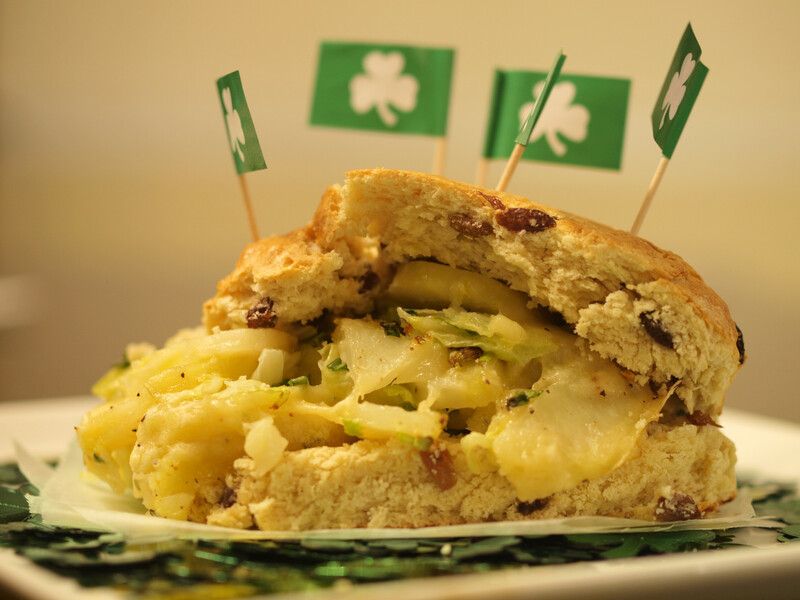 The Irish Soda Bread added a great sweetness to a savory sandwich. With all this praise, you must be asking why the grade of an A minus? The soda bread, it was just so extremely dense that at times, it was simply too much. 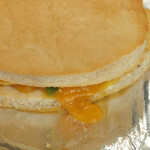 My suggestion for you, if you do decide to make this sandwich and I suggest that you do, is to make it open faced. 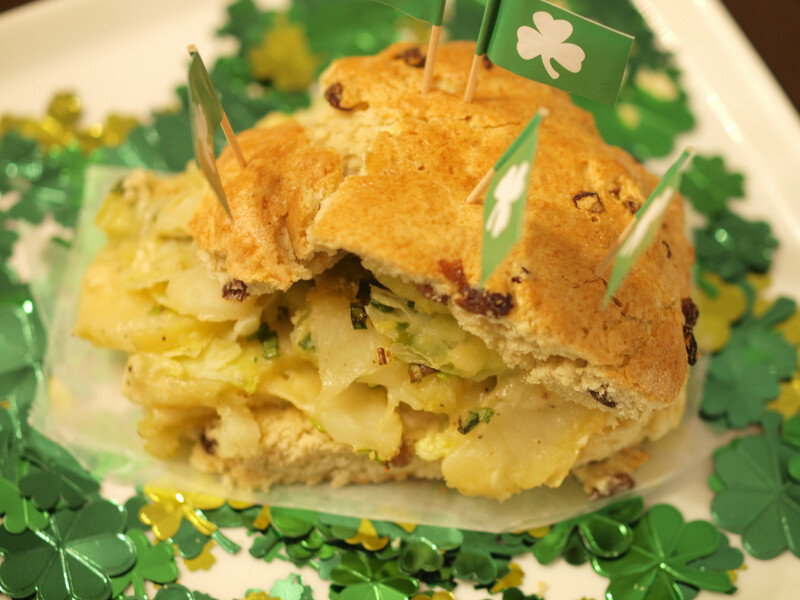 Simply go with a base of Irish Soda Bread followed by the potato/cabbage concoction and eat it with a knife and fork and you will be more than all set. 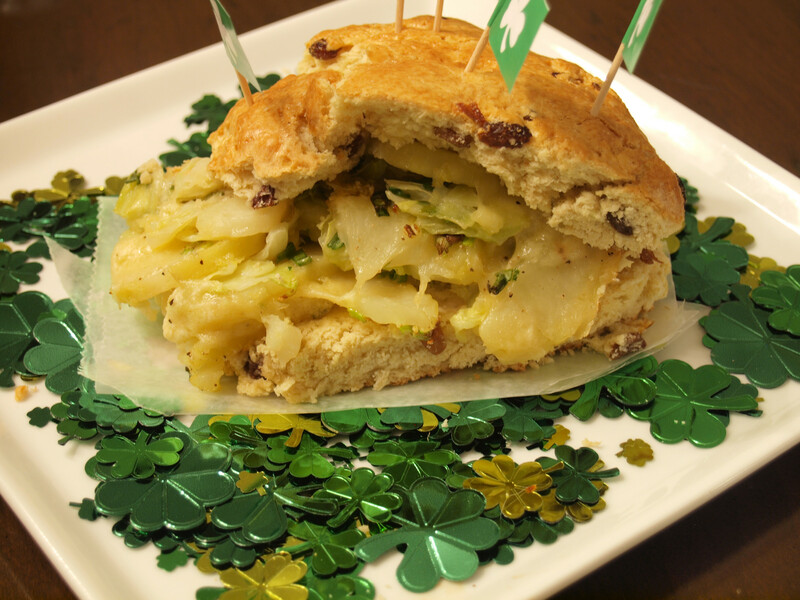 This was a winner and perfect for any St. Patrick’s Day celebration. 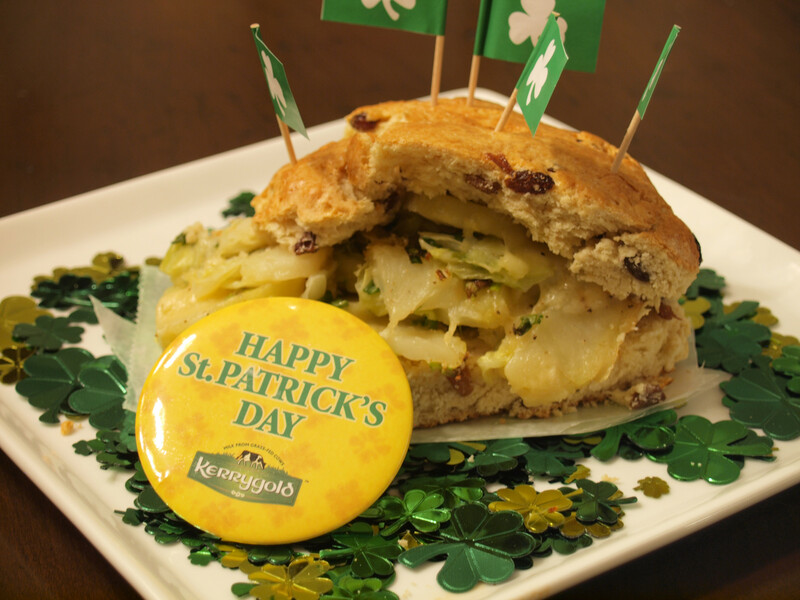 Posted in Grilled Cheese and tagged A Minus, baked, cabbage, dubliner cheese, dubliner cheese with irish stout, green onion, irish soda bread, kerrygold, potatoes, st patricks day.